Safetots are committed to your satisfaction with our products. If you have received a product and you are not 100% satisfied please call our customer service team during office hours (8.00am - 6.00pm Monday to Friday) on 01438 728 888. Alternatively you can email info@safetots.co.uk with your concerns. As a Baby Safety Company, a number of our products do require installation. Although we always try to source items with the simplest form of installation, we do understand that for some people installation can be a little difficult. If for an reason you are struggling with the installation of your item, please do call our customer service team who will talk you through the process. In the unlikely event you do receive a product which is simply not suitable for your home, or damaged in any way, please see our returns policy below which will guide you through the simple steps of getting items back to us for a full refund. Safetots offer a 365 day return policy. 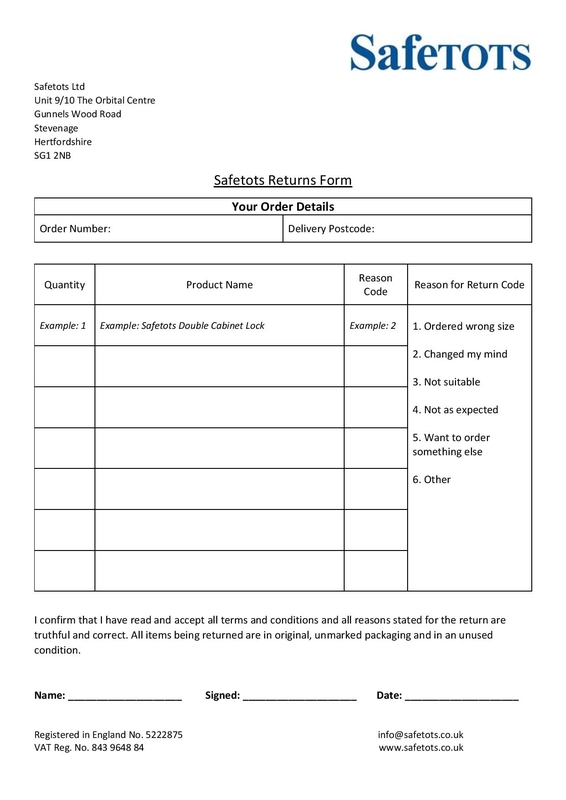 If you would like to return a product you have purchased from Safetots within the last 365 days and the item satisfies the criteria detailed below, Safetots will accept the item back from you and refund your original order the cost of the return products. Please note all returns to Safetots MUST have the printed and completed Safetots Returns Form or a refund cannot be issued. All items returned to Safetots WITHOUT the completed Returns Form will be disposed of as second-hand goods. Please download the Safetots Returns Form here. If you are unable to download this form, then please email Safetots at info@safetots.co.uk to request one. Please read all our returns terms and conditions below before downloading our returns form. If you have any questions please call our customer service team on 01438 728 888. If for any reason you are unhappy with your purchase you can return items back to our warehouse. All items can be returned back to us within 365 days of receipt. Please note that all items returned to Safetots must be in an unused, fully resalable condition for a refund to be issued. We simply ask customers to only send an item back if they would be happy to receive the exact same item ‘as new’ if purchased from a retailer. Please note the cost of returning the item is the responsibility of the customer. How to Return an Item and How Much Does it Cost? Safetots only require your original order number to be included with the returned item for us to match your order to enable us to refund you. Ideally please include a copy of your original order with the item you are returning. All items returned to Safetots are at the customer's expense. You can return your items to us by the method of your choice. We do suggest using a registered or tracked courier service as Safetots are not liable for any items which may get lost in transit. If you would like to use the Safetots courier service to return an item to Safetots you can request this by calling us on 01438 728 888 or emailing info@safetots.co.uk. The service costs £15 and if for any reason you are not available to pass on the returning goods to the couriers on the week day you have requested, a further £15 is added for every failed pick up attempt. The fee of £15 will then be deducted off your refund amount. Please note Safetots cannot pick up from International addresses. When and How Much Will I be Refunded? All orders returned back to us in a fully resalable condition will be refunded the full cost of the items returned. Refunds take place each week on a Friday. If you have selected to use the Safetots courier service your order will be deducted minus the £15 charge. If you wish to cancel your order and contact Safetots prior to your items leaving our warehouse, we will be able to stop your order and refund your payment in full. If your item has already been dispatched and you contact us to cancel, Safetots will recall the item for you, but the initial dispatch charge, plus the £15 return fee would be deducted from your refund. If you wish to change your delivery address and contact Safetots prior to your items leaving our warehouse, we will be able to stop your order and change the delivery details. If your item has already been dispatched and you contact us to change the delivery address, Safetots are able to contact the couriers to change the address, but a £15 charge is payable for the redirection of a parcel. Please note if the address change in within the same postcode region and does NOT require a depot change from the couriers, we may be able to do this free of charge. If your goods arrive damaged from our courier service please contact Safetots before sending the items back to us. Once we receive images from you of the damaged goods and a description of how they were delivered we will issue an immediate replacement free of charge. If Safetots require the items back we will arrange a free of charge collection. If your goods arrive faulty or develop a fault during use please contact Safetots straight away with the details. We can then contact the manufacturers and if a fault is established, a replacement will be issued. If the item you have purchased from Safetots develops a fault up to 30 days from the date of purchase, under the Consumer Rights Act of 2015 and the ICACS Regulations of 2013 you are entitled to a replacement of the product or a full refund of the item within 14 days of the point of Safetots arranging pick up of the item. If the product develops a fault within 6 months of the purchase you are entitled to request we repair the item or in the event of a repair not being possible to replace the item. In the event a product has developed a fault due to fair wear and tear, accidental damage or misuse, Safetots will not offer a repair, replacement or refund.